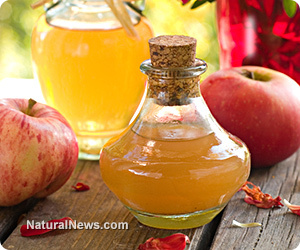 (NaturalNews) Apple cider vinegar has been used in folk medicine for hundreds of years. Apple cider vinegar has also been utilized to treat allergies, acne, flu, pets, and dermatitis. Apple cider elevates pH levels, increasing alkalinity in the body. It is anti-bacterial, antiseptic, anti-viral, and anti-fungal. Hippocrates recommended apple cider vinegar over 400 years ago, and the Bible advises the use of vinegar to treat infections and wounds. It's easy to come by, and inexpensive to use. Apple cider vinegar treats a wide variety of health problems It's an aid to the digestive system and cleanses skin and hair. It's best to purchase apple cider vinegar from organic apples. Vinegars that have been processed are stripped of the health-giving nutrients, so look for a natural unfiltered organic apple cider vinegar. Apple cider vinegar contains over 90 different nutrients, including potassium, calcium, magnesium, chlorine, copper, iron, fluorine and sodium. Apple cider vinegar also contains two ketones, 13 types of carbolic acids, various trace minerals, amino acids, and fiber from apple pectin. Apple cider vinegar has a lot of vitamin C and some amounts of vitamins A, B1, B2, B6 and E. Acetic acid is one of the main ingredients in apple cider vinegar. This compound causes a release of energy from fat and carbohydrates, making apple cider vinegar an aid to weight loss. Apple cider vinegar has long been used as an aid for digestion. It increases the acidity of the stomach, which helps digest protein, and other foods that need an acid environment. For low stomach acid or sluggish digestion, apple cider vinegar is an easy to use digestive aid. Simply add one teaspoon of apple cider vinegar to one glass of water (warm or cold) and sip with each meal. Alternatively, you can add one teaspoon to a large container of water and drink throughout the day. Drinking this throughout the day keeps the body's pH in an alkaline state but only drink before or after a meal. For treating sinus infections or allergies, sip a small amount of apple cider vinegar to break up the mucus and clears the sinuses. Apple cider vinegar can also be used as a hair rinse, providing a balanced pH to promote hair growth and scalp health. Vinegar is high in alpha-hydroxy acids, which causes the removal of skin cells from the hair follicles and the scalp. The pH of the apple cider neutralizes the scalp's pH and removes residue left from shampoos and conditioners. Hair will be less tangled and have less frizz. Apple cider vinegar will also help heal scalp conditions such as dandruff, by correcting the scalp's pH. Apple cider vinegar is inexpensive, easy to obtain, easy to use, and has no side effects. You can even make apple cider vinegar at home. Add a "mother of vinegar" to apple cider and leave it to ferment. The "mother" is a form of bacteria that turns into acetic acid. Apple cider vinegar has many healing abilities. It's an old-fashioned remedy from grandmother's kitchen that brings its folk tradition of healing to modern times.